Maxwell Reid Thurman was born on 18 February 1931 in High Point, NC. He attended North Carolina State University and graduate with a Bachelor of Science degree in Chemical Engineering (Ceramics). While in college, he was a member of the Professional Engineering Fraternity, Theta Tau. He was commissioned a Second Lieutenant of Ordnance from NCSU's Reserve Officer Training Corps program in 1953 but transferred branches to Field Artillery. His first assignment was with the 11th Airborne Division and in 1958 deployed his Honest John Rocket platoon to Lebanon. From 1961-63, he served in Vietnam as an Intelligence Officer for I Vietnamese Corps. Following his service in Vietnam, Thurman was one of the first non-Academy graduates assigned as a Company Tactical Officer at the U.S. Military Academy. In 1966 he attended the Command and General Staff College, then returned to Vietnam in 1967. He assumed command of the 2d Howitzer Battalion, 35th Artillery Regiment in 1968. 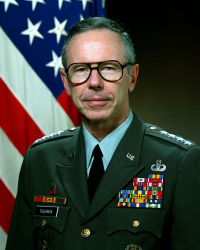 After completing the U.S. Army War College in 1970, Thurman held numerous troop and staff assignments before eventually assuming command of U.S. Army Recruiting Command in 1979. When he took command, enlisting was generally viewed as an option for slackers. Behind the slogan, "Be all you can be," Thurman was able to blot out that perception and begin a trend of attracting high-quality recruits. His highly successful "BE ALL YOU CAN BE" recruiting campaign helped reverse the downward slide of Army recruiting. From 1981-83 he was Deputy Chief of Staff of the Army, Personnel (DCSPER). 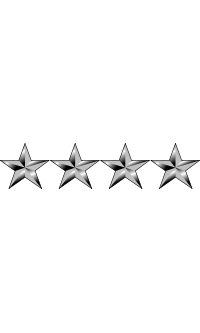 He was promoted to four-star General on 23 June 1983 and from 1983-87 he served as Vice Chief of Staff of the Army (VCSA). In 1989, Thurman applied for retirement while serving as Commanding General, U.S. Army Training and Doctrine Command (TRADOC). Instead, he was handpicked by President George H. Bush to be Commander-in-Chief, U.S. Southern Command. In this position, he planned and executed Operation Just Cause, the 1989 invasion of Panama that ousted strongman Manuel Noriega. Shortly after Operation Just Cause, he was diagnosed with acute myelogenous leukemia while still Commander-in-Chief of U.S. Southern Command. Thurman's image as a workaholic - captured by the nickname "Mad Max" - was as widespread as his reputation as a master organizer. He conducted SOUTHCOM business from his hospital bed at Johns Hopkins Hospital in Baltimore after he was admitted for treatment in July 1990. One of the men most responsible for the Army's positive image and success through the 1980s, General Thurman Maxwell Reid Thurman, retired in February 1991 after more than thirty-seven years of Army service. In August 2010, Thurman was posthumously inducted into the Theta Tau Alumni Hall of Fame for outstanding contributions to his profession. An award is given every year by the U.S. Army Medical Research and Materiel Command (MRMC) in honor of General Thurman. The award is generally presented at the American Telemedicine Association annual meeting. In between returns to the hospital for treatment of his leukemia, General Thurman kept a rigorous schedule of travel to conferences and speaking engagements. He took every opportunity to talk with, or about, soldiers and the Army. General Maxwell Reid Thurman died on 1 December 1995 at Walter Reed Army Medical Center in Washington, DC. He was 64. The funeral service was held on 7 December 1995 at the Fort Myer Chapel, followed by interment at Arlington National Cemetery in Arlington, VA. His burial site is located in Section 30, Grave 416-A-LH. Thurman is survived by his brother, retired Army Lieutenant General John R. Thurman III of Alexandria, VA.
Thurman's image as a workaholic - captured by the nickname ""Mad Max"" - was as widespread as his reputation as a master organizer.